“Our staff gets people smiling as they shop. Smiles produce endorphins which can be a first step in healing and recovery,” says store owner Shulamit Slotki from Ma’ale Adumim. Aside from just making us all feel great and experiencing more love, we know from Norman Cousins and others in the medical world that laughter works wonders. Maybe that’s why when you walk through either of Shulamit’s and Yehuda’s Milk & Honey health food stores in Ein Kerem or Ma’ale Adumim you enjoy an immediate relaxation response and a sigh of relief from everyday stressors. The reason her stores are so popular begins with the joyful welcome you receive as you enter, but it doesn’t end there. You’ll soon see that there’s way more to this story. In Ma’ale Adumim the store is prominently placed in the original mall between the friendly “mom & pop” Russian drug store and Burgers Bar on top of the first inside circle. 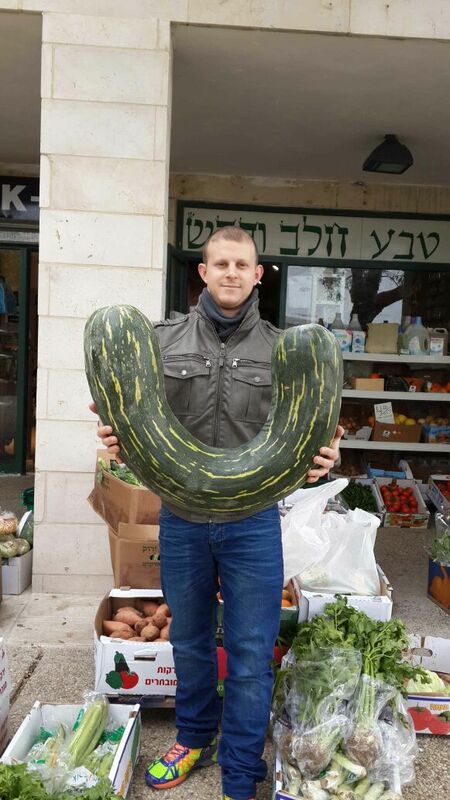 Her son and partner, Yehuda Slotki, is the manager of this great shop and has a wonderful knowledge of health, nutrition and wellness with an equally well-informed and helpful support staff available for questions. There is always a “buzz of excitement” in the air as people roam the isles for new products knowing that the prices are very competitive. 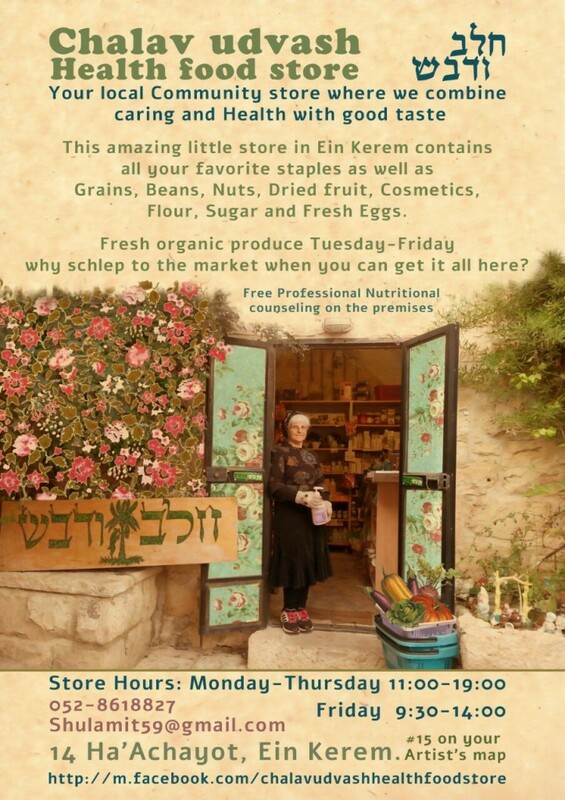 Her shop in the beautiful artist’s village off Ein Kerem is in the forest valley below Hadassah Hospital and the Holocaust Museum (Yad Vashem). Shulamit’s ancient stone shop in this mini-“Woodstock-looking” village is located on a quaint European-like side street. Within the Ein Kerem branch you’ll find remnant architecture from the Second Temple period. Each room and courtyard, filled with amazing nooks and crannies, speaks of historical Jerusalem long ago. You feel surrounded by the vitality of friendly neighbors, many of whom are artists and entrepreneurs. They have created a supportive and united joint-marketing community with interactive tours of homes and artist’s studios and shops. Shulamit lived the first 35 years of her life, since the age of 16, suffering from asthma, migraines, irritable bowel syndrome, ulcers, chronic fatigue and arthritis. Her health problems increased while raising four children in Israel with her husband Yitzhak, professor of medicine at Shaare Zedek Medical center. During a stay in Boston (where Yehuda, their fifth child, was born) while Yitzhak researched kidney disease, Shulamit studied the macrobiotics way of life for two years with world master Michio Kushi, the father of macrobiotics. After following Kushi’s regime for just three months all her symptoms disappeared! On top of this, with the whole family enjoying macrobiotics, none of their children got sick during that period. 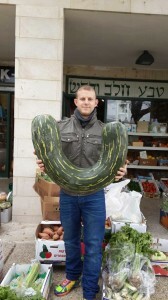 As a result of the success of this remarkable personal lifestyle and diet modification, Shulamit decided to devote her life to helping others through nutritional knowledge and friendship. What separates this health food store from many others is the extraordinary woman who started the business. “I believe I was put on earth and given all these illnesses in order for me to pursue the knowledge so I can help others,” says Shulamit. Whether it’s advice on nutrition, healing, soothing your soul, or creating better relationships, Shulamit has a point of view she is willing to share. So as you’re shopping, be prepared to get your money’s worth and an experience to boot!